Muller du Plessis’ preparation for a professional rugby career began when he was just five years old. The future Blitzbok didn’t realise it at the time, of course. He just wanted to imitate his 13-year-old brother, JP, who had been training with their father, Charl, since the age of nine. 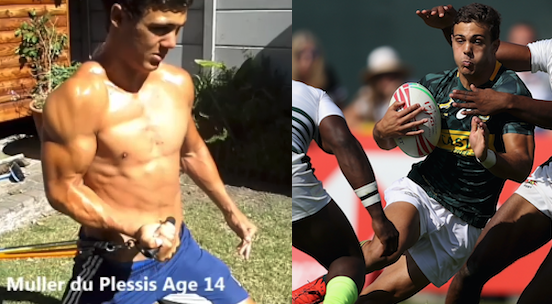 Charl, a former Transvaal fullback and Lions fitness coach, had asked his brother-in-law, a doctor, how best to develop JP physically and was told about elastic resistance bands. Using them, he created training exercises for his eldest son that built functional strength (strength in movement), increased speed and fitness, and developed motor skills (functions that involve the precise movement of muscles with the intent to perform a specific act). The Du Plessis boys, who grew up on the family farm in Bethlehem in the Free State, had a strict training regime, even during school holidays at the coast. When other kids were sleeping in, they would wake up early, train intensely with their dad and then be allowed to go to the beach. In the afternoon, they would train again. ‘Sometimes we didn’t have anything to hook the resistance bands on and had to use a wheel or towbar from our car,’ Muller recalls with a laugh. While it may sound like a boot camp – and JP admits there were times he and Muller wished they could ‘just be normal’ – Charl ensured the sessions were fun and stimulating. And all that hard work paid off when the brothers went into pre-season training at school having already had a pre-season of their own. It put them on another level in terms of strength and conditioning to the other boys, and they stayed there by continuing to put in extra training hours during the season (watch the 13-year-old in action in the video below). Charl believes if a youngster develops their speed, skills, strength and stamina, the fifth ‘S’ – self-confidence – will follow. Muller is proof of that. JP attended primary and high school in Reitz, a small Free State farming town, before becoming a boarder at Paul Roos Gimnasium in Stellenbosch, while Muller went from Reitz Primary to Paarl Gimnasium Primary in Grade 7. There’s a two-minute highlights video on YouTube, simply called ‘Muller du Plessis’, which shows him on the attack for Paarl Gim’s U13 team against Kenridge Primary. Playing at inside centre, he chases down a kick ahead, shows great skill to pick up the ball just before the tryline and dives over. Later in the first half, Du Plessis collects a loose ball outside the opposition 22 and glides across field, around the bunched defence, to score. 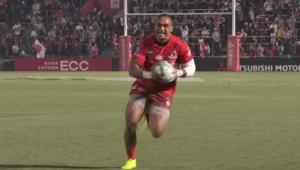 In the second half, after receiving possession on his 10m line, he steps inside the Kenridge scrumhalf and flyhalf, before leaving another six defenders for dead on his way to the tryline. Du Plessis’ fourth try is the best of the lot. He gets his hands on the ball 5m from his own tryline, and after evading a few would-be tacklers, steps the Kenridge fullback just inside the opposition half. The No 8 doesn’t come close to getting a hand on Du Plessis inside the 22 and he dives over under the posts as the credits begin to roll. The video, Du Plessis explains six years later, was put together by a friend’s mother, and he laughs at the accompanying music (‘Atenna’ by Zorba The Greek). The most notable aspect of young Muller’s performance that day is how easy and effortless he made it look. JP says he can take some credit for that. In primary school, Muller was selected at flyhalf or inside centre, where he could get his hands on the ball often and control the game. However, his high school coaches preferred to play him at fullback, so he could counter-attack in space from the back and join the backline at speed. He also excelled at athletics, breaking school records in sprinting and long-jump that had stood for 40 to 50 years. Having represented the Griffons at U12 level while at Reitz, Du Plessis’ performances for Paarl Gim Primary earned him selection for Western Province’s U13 Craven Week team. Injury prevented him from playing at the U16 Grant Khomo Week, but he would participate in two successive U18 Craven Weeks, in 2016 and 2017. He played for SA Schools in both of those years too, scoring four tries in six matches, all on the left wing. When the time came for Muller to sign his first professional contract, JP gave him some valuable advice. The elder brother had unconventionally joined an Australian rugby league team, the Sydney Roosters, straight after school, before returning to rugby union with the Rebels. The midfielder soon headed back to the Cape, though, where he played for Western Province and the Stormers, before stints with Montpellier in France, and the Cheetahs and Kings back in South Africa. JP played for the San Diego Legion in America’s inaugural Major League Rugby tournament in 2018 and will do so again in 2019. 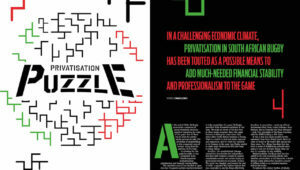 However, these days he devotes most of his time to his business interests, including Ultimate Sports – a company that designs, manufactures and sells elastic-band training equipment with training programmes – that he and his father started. 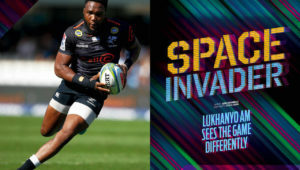 While Western Province tried to keep Muller in the Cape, he opted to sign a tripartite agreement with the Sharks and SA Rugby that allows him to play sevens for the Blitzboks and be available for the Sharks when required. From 2021, he will focus fully on fifteens. Du Plessis was offered the chance to join the SA Rugby Sevens Academy by Blitzboks coach Neil Powell and high-performance sevens manager Marius Schoeman after they watched him play for Western Province at an U17 interprovincial sevens tournament at Paarl Gim. ‘After chatting to my family, I decided to join the sevens set-up early in my career so I could develop my skills and build my confidence,’ he says. ‘In sevens, you have more one-on-one time with coaches, where you can focus on the basics, while in fifteens you spend more time training with the team. Du Plessis hopes to help the Blitzboks qualify automatically for the Olympics by finishing among the top four teams in the current World Rugby Sevens Series. Having participated in four tournaments during his debut season in 2017-18, he made a good start to the 2018-19 campaign by scoring six tries at the Dubai Sevens, including three against Fiji, only to suffer a back injury during the Blitzboks’ first match of the Cape Town Sevens, against Samoa, that ended his tournament. Du Plessis also suffered an ill-timed injury at last year’s World Rugby U20 Championship. The left wing scored a try for the Junior Boks in their pool match against Ireland, but was replaced at half-time because of a gluteal muscle injury that put him on a plane back home. He should, however, have another chance to impress at U20 level in Argentina later this year. Du Plessis’ long-term goal is to become a Springbok. For now, though, he wants to establish himself with the Blitzboks, take care of unfinished business with the Junior Boks and grab his opportunities with the Sharks when they come along. The 19-year-old knows he will continue to receive unwavering support from his father and brother, as well as his mother, Annelise, who he credits for ‘keeping their faith in the family strong’. Charl is always the first to phone his youngest son after a game and give an honest assessment of his performance. 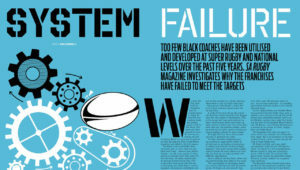 – This article first appeared in the March 2019 issue of SA Rugby magazine.